That summer, the girl sitting next to me wore a “Frankie Say Relax” shirt quite often. We both sat behind large, green electric typewriters, learning how to touch type. If we made mistakes, we had self-correcting tape which left an obvious white mark on our papers. Learning how to type was very frustrating; it was much easier to just pick up a pen and WRITE. Just a couple of years later I headed to college, my typing skills much improved. I was the proud owner of a slick Smith-Corona typewriter. It still left white correction marks on my paper, but the keyboard typed much more smoothly than the green clunker in that high school classroom did. That typewriter helped me hand in many papers on time; that typewriter helped my GPA. In just a couple of years typewriters became outdated, and I spent time in the computer lab using WordPerfect for my papers. There’s something about getting the words down on paper; something about typing on a keyboard and seeing those black squiggles on a white background. Later on, about a year after I was diagnosed with breast cancer, I was in a funk. I needed to climb out of my cancer-brought-on depression, so I went back to basics. I bought a journal and began to write a gratitude journal. This writing was not for a teacher; no grades would be assigned–I just wrote. Writing was hard at first. Finding things to be grateful for was more difficult than I imagined. Sometimes it was that bowl of ice cream I ate or a phone call from a friend. But the more I wrote, the more I kept on writing. My journals filled up with daily events. The funny thing was, when my life became happier, I stopped writing. I was dating my husband, and my journals stop just about the time we were engaged. I had a wedding to plan, and a new job to find. I was so happy, but none of that happiness made it into my journal. It wasn’t until I discovered the world of blogging that I began to write regularly again. This time, the tick-tapping of my fingertips was on my very own laptop. Back in college, I never dreamed I would own my very own computer…much less a computer that I could literally fit on my lap! Once again, I fell in love with filling up that white space with black squiggles. So why in the world would I go back to pencil and paper? Writing with a pencil is different than writing with a pen or a keyboard. The pencil makes a scritch-scratch noise as it writes. I feel the ragged friction as the tip presses across the paper. It is second nature to turn the pencil around and erase a mistake almost as soon as I make it. I can draw arrows, circle, underline. Writing with a pencil takes longer than typing does. It is more laborious, which makes the words more precious. I also did something last week that I haven’t done since college; I wrote notes in a book. In a strange way, writing those notes made me feel more of a connection with the author; it was almost as though I was communicating with him. Communications he will never see, of course, but writing down my thoughts as I read made my reading a little more meaningful. I love to write, not necessarily because I am filling up the page with words worth reading. It’s more a matter of the senses; seeing black on white; hearing the click-clack of the keyboard or feeling the scritch-scratch of the pencil; seeing paragraphs form and then having a sense of accomplishment. I know what you mean….about when we're happy we tend to not write as much. I used to belong to a poety writing club and got started in it as "something to do." When my life became more full and I had less emotions to lay out on paper, I wrote poetry much less frequently! And I still have the nasty habit of writing in the margins and hilighting in the books I read! I very seldom actually write, unless I'm writing a check or writing in my planner. However, I'm typing all of the time!!! When I write my posts, they go right into the computer for ease of editing on the fly. When I journal, however, I love the intimacy of writing, of mostly carefully considering my words and getting them onto the page. Other times, it is a flurry of anger or fear or excitement, and I will write like a madwoman against the building storm, often finding peace or a resolution by the time I am done. 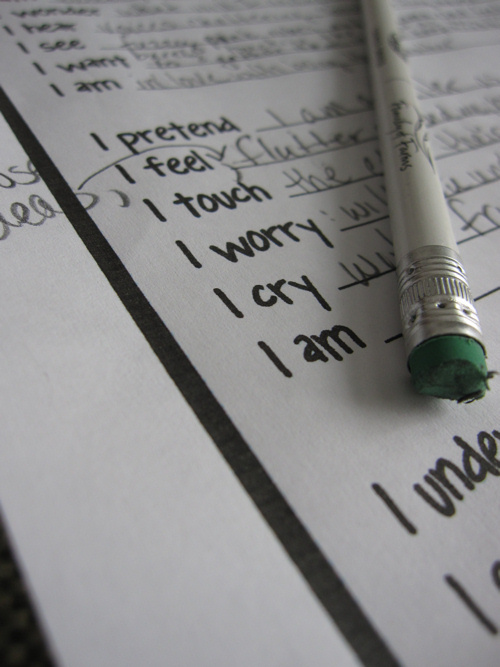 Writing by hand can reveal problems, offer up solutions and create tears of sadness and joy. I highly recommend it to anyone who has not experienced the power of journaling! I cannot help but wonder if this is the same reason that I've got to write everything out for my blog – I have/had notebooks filled with HTML written out with pencil and paper. It helps me to better visualize what I'm going to create, display, if I have it in front of me on a piece of paper where I can physically see it. Otherwise, I end up having to refresh my page like a zillion times. It's funny how we only write when life is not going our way, but I think that it helps us to remember that whatever is happening will eventually pass. However, I think that more of us need to make a concentrated effort to remember the happier moments. What have I written lately? Well, other than yet another recipe (chocolate meringues!) on my blog, there's that short story that just got published in Pockets (author copies arrived *today* in the mail–yippee!) and lots of comments on my students' papers. I have an iPhone which has a listmaker on it. I still write it out on paper though. Striking through my check marks still gives me a thrill that touching a screen will never do. That's right…you're a List Maker! (With a capital 'L") I agree with you the physical marking off of tasks completed. I just checked your blog again, lady…when are you going to write a new post? Not that I'm pestering you, of course…. I wish I could get back to writing with a pen or pencil, but honestly, I never was able to let the words flow out of me like I do when I type (I type way faster and can keep up with my brain better). Plus, sadly, my hand cramps up now when I write more than a paragraph. But I often think about that fact that, years from now, my son and grandchildren will likely not know what my handwriting even looks like. Typing class had to be one of my favorite classes! Not because of the class but because there were only 4 of us and my best friend sat behind me. Lots of laughs! I tend to write on paper about the toughest things. It helps me see things clearer for some reason. I've tried typing out my emotions but it doesn't give me the same clarity. Most of what I write is never meant to be read, more of way for me to make sense of things. Maybe it's the amount of time it takes to write something, maybe it helps process thoughts differently. Either way, there's definitely something different about handwritten journaling! You know, I'm really intimidated by the idea of writing with pencil on paper. I don't know why. (Maybe because I've never liked my handwriting?) Lately I've been wanting a private place to write though. I have two, empty notebooks in my closet and I keep looking at them, thinking I just might get them down. This post makes me want to hear that scritch-scratchy sound! 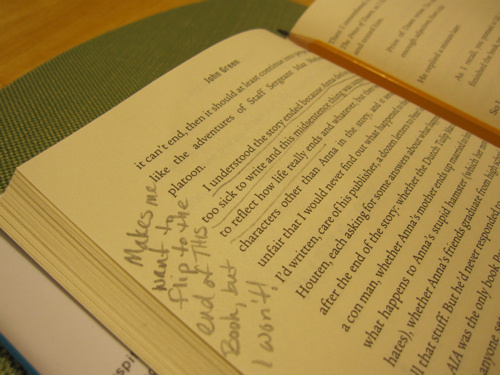 I totally know what you mean about writing notes in a book feeling like engaging in a conversation. I’m pretty much addicted to any kind of writing. Typing into WordPress fields, clicking my way over MS Word, scribbling in journals (of which I have 3 at any given time, each for their own kind of writing) or commenting in the sidelines of books. Each has their own different kind of feel and service a different need. Life sure does get busy, but I’m so glad you got back to writing!